The Griz are hitting the road after a stinging homecoming loss to Portland State. With this loss in the rearview mirror the Griz need to get refocused fast and back on track. Up next is a non-conference matchup against the North Dakota Fighting Hawks. This is going to mark the 3rd consecutive run-heavy team the Griz will have faced and is presumably the best defense they’ll have seen this whole season. For the Griz to get back on track they’ll have to stand up and face their biggest challenge of the season so far. 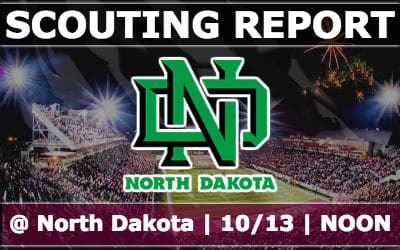 UND is coming off a bye week, they’ll be rested and ready, and while UM was listed as an early favorite I’d assume as the week goes on UND will tip to being the odds-on favorite to win. 35-7 win vs Mississippi Valley State – Looking at the yardage you’d think UND would have had more points. 225 passing, 293 rushing, 33:30 of clock time, 80 plays in the game, and just 1 lost turnover. However UND did get penalized almost 80 yards in the game and also missed 2 fieldgoals. MVSU passed for nearly 270 and couldn’t run at all, finished with -27 yards, mostly on account of the 7 sacks they gave up. 3-45 loss @ Washington – Well yeah, what would you expect? UW ran for 200 and passed for 440 while UND ran for 160 and passed for 100. Better showing for UND at UW than Montana had last year though. 24-23 win @ SHSU – This one got some attention, SHSU at the time was ranked 4th in the nation (now 15th after suffering 2 losses). It was a game that didn’t feature a ton of offense, about 390 for UND and just 300 for SHSU. This game featured a few big lead changes, UND opened up 7-0, SHSU tied it, and then UND scored 10 unanswered, but SHSU kicked a field goal right before the half to make it 17-10 UND. In the 2nd half scored 13 unanswered to get the lead but UND answered with a 12 play, 84 yard drive scoring a TD with 4:44 left in the game. SHSU with the ball back went 4 and out, and UND killed the clock. SHSU’s 300 yards of offense was their lowest total output since 2014, running for 99 and passing for 201. What UND did successfully against SHSU was force them to kick fieldgoals instead of score TDs, additionally in wake of the UND kicker being 2-5 on the season at that point they decided in their key 4th quarter drive to opt not to kick a fieldgoal but to go for it twice on 4th down and successfully convert both. 21-25 loss @ Idaho State – Fresh off a big win UND hit the road again but fell flat to now red hot ISU. UND was up 14-3 in the late 1st quarter but from there ISU scored 13 unanswered to grab the lead. The 1st half of this game was where most of the scoring action was, it seems, 4 TDs and 4 field goals combined to set the halftime score at 21-19 in UND’s favor. In the 2nd half there was just 1 lone score, with 7:00 left in the game ISU connects on a 62 yard bomb, but fails to get the 2-point conversion, giving them the eventual 25-21 winning score. ISU in the 2nd half missed two fieldgoals (one blocked I think) as well and punted 5 times, while UND had a rough showing, 2 thrown interceptions and 5 punts of their own. There was over 1000 yards of offense in this game too, both on fairly balanced attacks. ISU had 566 total while UND had 469 total. UND had 3 costly turnovers and 1 turnover on downs. 38-13 win @ Northern Colorado – UND got back to what they do best, rushing for over 350 yards and controlling the clock in a major way. UNC had just 201 yards of total offense and was 1 for 10 on 3rd down. 2 for Montana and 4 for UND but some of those are awfully close on the total offense and total defense. #22 John Santiago, RB – We all know this dude, he’s 5-9, 187 and a burner of a running back and a return man. He missed the UNC game with a knee injury but is expected to return after resting for that game and the bye week. He’s basically averaging 100 yards/game rushing, 13 yards per game receiving, 8.75 yards per punt return, and almost 21 yards per kick return. #5 Brady Oliveria, RB – The bigger back (but not the biggest) at 5-10, 220. Olveria is averaging about 76 yards per game rushing and has 3 rushing TDs this season. He’s got a few catches for about 30 yards this season too. #33 James Johannesson, RB – The biggest back, 6-1, 250, accounts for about 50 yards per game rushing, had 141 against UNC, and has a few catches himself. #8 Nate Ketteringham, QB – At 6-3, 210 Nate’s passing for 171 yards per game and completing passes at about a rate of 55%. He’s got 6 TDs passing to 3 INTs. He’s part of the run game too, because of course he is, he accounts for about 23 yards per game and leads the team with 4 rushing TDs. #11 Travis Toivonen, WR – Another 6-4 WR, he’s 2nd on the team in receiving yards with 147 and has 2 TDs as well. #55 Mason Bennett, DE – A 6-4, 257 pound D-end in their 3-4 scheme Bennett leads the team with 6 sacks so far, 7 TFLs, and 4 QB hits. #40 Noah Larson, LB – One of the 2 outside linebackers, Larson is an RS frosh in his first year starting but leads the team so far with 28 tackles and 2.5 TFLs. #25 Jordan Canaday, S – One of the few returning statistics leaders from last year, Canaday is a big safety at 6-2, 198. He’s got 20 tackles, 2 INTs, 5 PBU’s and 0.5 sacks. #44 Donnell Rodgers, LB – A 6-1, 250 linebacker who starts on the opposite edge of Larson, he’s got 25 tackles, 4 TFLs, and 2 sacks. 1. Learn and adapt from what worked (and what didn’t) against PSU’s defense. UND runs a 3-4 with some stout interior linemen and their defense spreads around the stats. The Griz found success with tempo and keeping that defense from holding Sneed in check. No slow, developing plays as UND has a great knack for getting after the QB (20 sacks so far this season). 2. Attack through the air. It would seem that UND’s weakness is their pass defense, based on what the stats show. The Griz have a stable of pass catchers that need to have their best game this Saturday. Don’t totally abandon the run game of course, but know that through the air is where we’ll make our money on Saturday. And that said… Sneed needs to have his best passing game yet. 3. Score in bunches. What’s interesting about UND is the gaudy stats in many games but low overall scoring. Much like Cal Poly if the Griz can force UND into a game of keep-up, they may have issues doing so. They’ve got tall possession WRs and a game-changer in Santiago, but how much success will they have if the Griz can key in on that if they have a good lead? (not saying they will, but it would for sure be great). 4. Don’t let Santiago go wild. While UND has a legit 3-headed monster in the run game, and maybe a 4 headed one if you count their QB… Santiago is the difference maker there. I would assume that UND is going to be picking apart game film from the success that Sac and PSU had with their quicker/burner running backs and looking to attack us that way. 5. Contest deep passes. It seemed that last week PSU was able to easily connect on many deeper possession-type passes where their WR/TE would go up and get it without much to contest them. UND has two 6-4 targets they’ll look to do the same with, got to be more disruptive with those. 6. Force UND to fieldgoal attempts. Look I assume UND is going to get 200+ yards rushing and will get to our side of the field plenty. If the Griz can make key stops and force a fieldgoal attempt (or as UND history shows a failed 4th down conversion) the odds are in the Grizzlies favor that the drive could end without points. 7. Rekindle some ST magic. If there was ever a game we need big things from JLM and Flowers its this one. On the coverage side… once again, it’s Santiago, stay in your lane and don’t let him get a burst. 8. Avoid another game where the opponent has the ball for 38:00+ of TOP. I don’t expect the Griz to hold UND to at/near/under 30:00 of TOP, but we can’t have this defense out there for another near 40:00 of clock time again. Make some stops, sustain some drives. 9. Either win the turnover battle or simply have no turnovers. UND doesn’t have a lot of turnovers, don’t expect many opportunities there. The Griz need to better secure the ball and not make many mistakes on turnovers, if any. Simply cannot gift a power-run team a few possessions. 10. Keep Ketteringham in the pocket. On passing plays keep this guy from getting to the sideline and make sure if he steps up in the pocket he’s got a Griz defender to greet him. 11. Let UND hurt themselves. One thing that also jumps off the stat book to me is that UND is penalized on average of almost 80 yards per game. Let’s make sure they keep hurting themselves that way and avoid retaliation. 12. The team’s best game. This year in the two losses Bobby has shouldered the blame and we’ve had fans right here on this board pointing out coaching errors that possibly were contributing factors to the loss. Bobby and the staff needs to dial up their best game and limit or erase the few head-scratchers we’ve seen that pop up in close games. On the team side, execution has to be the best we’ve seen. Drops, fumbles, overthrows, missed blocks, missed tackles, missed assignments need to be at a season-low. I know a lot of fans are predicting a loss here and based on the stats and most recent outcomes, it’s easy to see why. The Griz are going to be challenged again by a 3-4 defense that swarms to the ball and is physical as hell. On the other side this marks their 3rd week in a row against a power-run team and they’re going to be tested there like they haven’t been before.